iBooks was introduced in 2010 for the iPad. 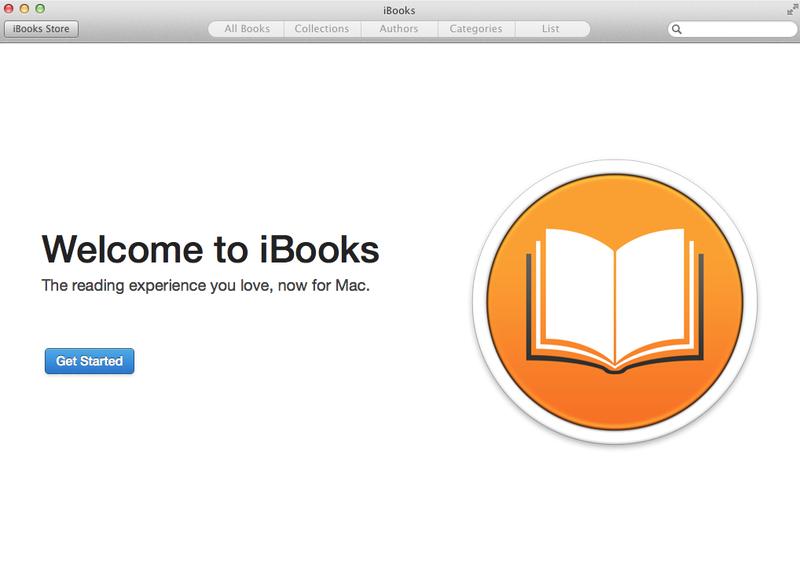 With Mavericks, 3.5 years after iBooks came out for iOS, Mac OS X finally gets in on the action. Unlike iOS devices that have to download iBooks from the App Store, the Mac comes pre-loaded with it. This how-to will discuss how to organize and read your books, and how to shop for new books in the iBooks Store. 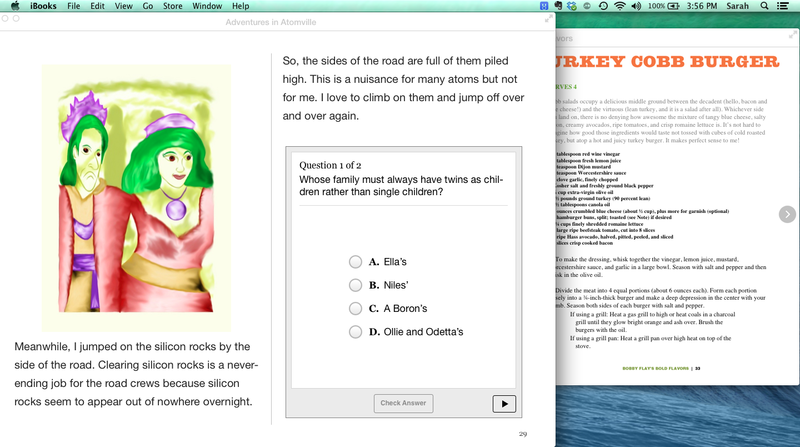 To download the books onto your Mac, select the book, then double click it. This will download and open the book for you. Once you start downloading books, you can check on the status of the download by clicking the button with an arrow on it in the toolbar. Just like you organize books on a physical bookshelf, you have several different ways to organize books in this digital bookshelf. To start organizing, I recommend clicking on “Sort By” in the upper-right-hand corner. From here you have several different options. “Most Recent” organizes the books by the order in which they were last opened, with the most recent up towards the upper left hand corner. Choosing “Title” organizes the books by the title. “Sort Manually” allows you to drag and drop the books in whatever order you like, such as newest purchase to oldest purchase. “Show Title & Author” puts the information underneath the book, making it easier to find. 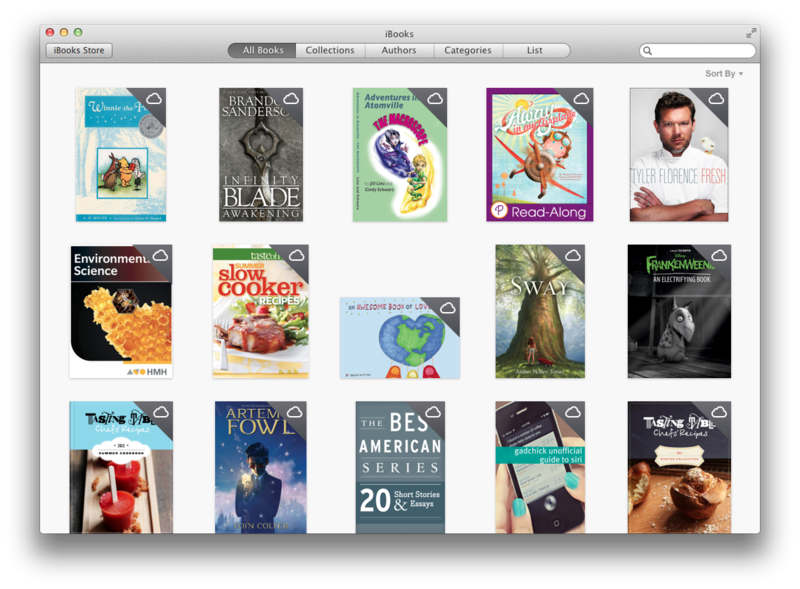 Unchecking “Show Purchases in iCloud” allows you to see the books that are only stored on the Mac. At the top, you have different viewing options. By default, when first using iBooks it is set to “All Books.” The next view is “Collections,” which is where you can find any PDFs that you have stored in iBooks. These will sync across all of your devices. Using Collections is an easy way for you to organize your bookshelf. By pressing the + button in the lower-left-hand corner, you can create a new collection, name it, and drag the book on top of the collection to add it. Instead of dragging the book into the collection, you can right-click on the book and select “Add to Collection,” “New Collection,” or “New Collection from Selection.” The collections you create will sync across all of your devices. Clicking on “Authors” at the top leaves the layout the same, but adds a panel on the left-hand side that lists all of the authors in your library. Clicking on a particular author will show you books that were written by that author. Clicking on “Categories” shows you the genre the books fall under. These are predefined from the iBooks Store and you cannot change the categories. The last layout view, “List,” shows you which books you have in a list view much like you’ll find in iTunes or in Finder. Here you are able to see when the book was last read, the date it was added, the file size of the book, as well as if the book is in the cloud or on your computer. To start reading a book, double-click on it or right-click it and choose “Read”. If the book you are reading has intro media, iBooks automatically starts playing it. While reading, swipe right-to-left with two fingers on your trackpad, click the arrow on the right-hand side, or use the arrow keys to turn the page. However, if the book you are reading has thumbnail previews, doing those commands will turn chapter-by-chapter. Clicking on the thumbnail opens up that page, and then you are able to navigate page-by-page. You can have two books open at the same time. 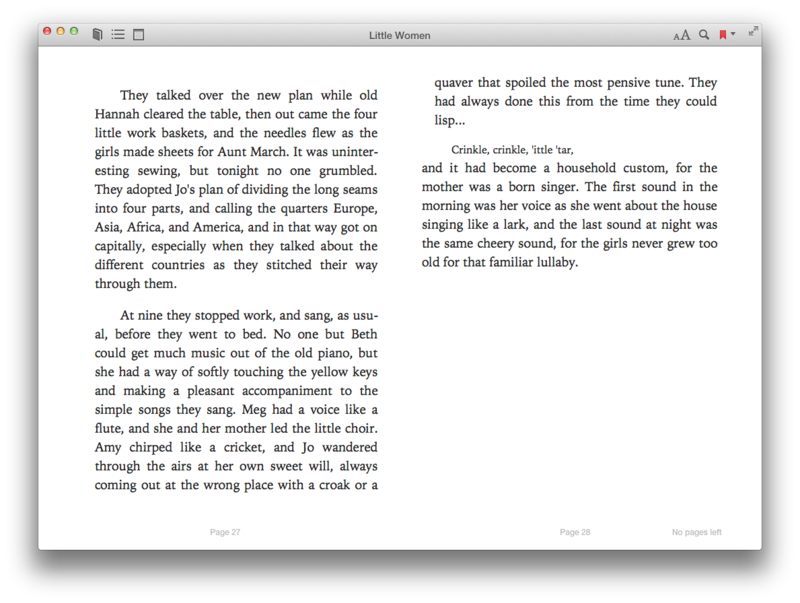 Clicking on the book icon in the upper-left-hand corner shows your iBooks library and opens it in another window. From there you are able to choose another book to read. This could be beneficial if you are doing research or if you just want to compare two different selections. Some books allow you to change their appearance. 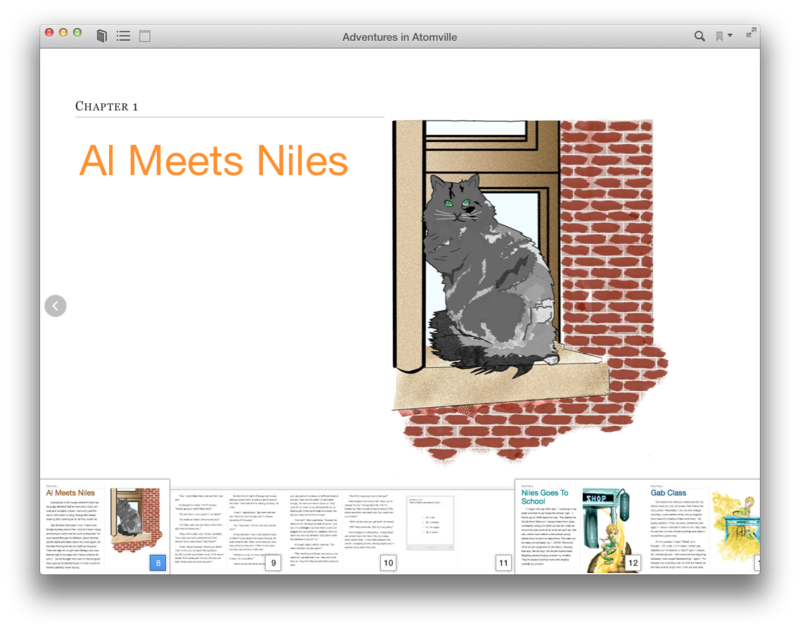 It seems that books made in iBooks Author do not allow you to change their appearance. If your book has the “aA” button in the upper right corner, then you are able to change the theme, font size, and font style of that book. Similar to customizing the books appearance on iOS, the bigger “A” button will make the font bigger. You are able to select a different font with one of three different themes: white (black on white), sepia, and “night” (white on black). You can make all books go into full screen mode by pressing on the button in the upper right hand corner with the two arrows pointing in opposite direction. While reading books, you can highlight different passages in the book and take notes while reading. 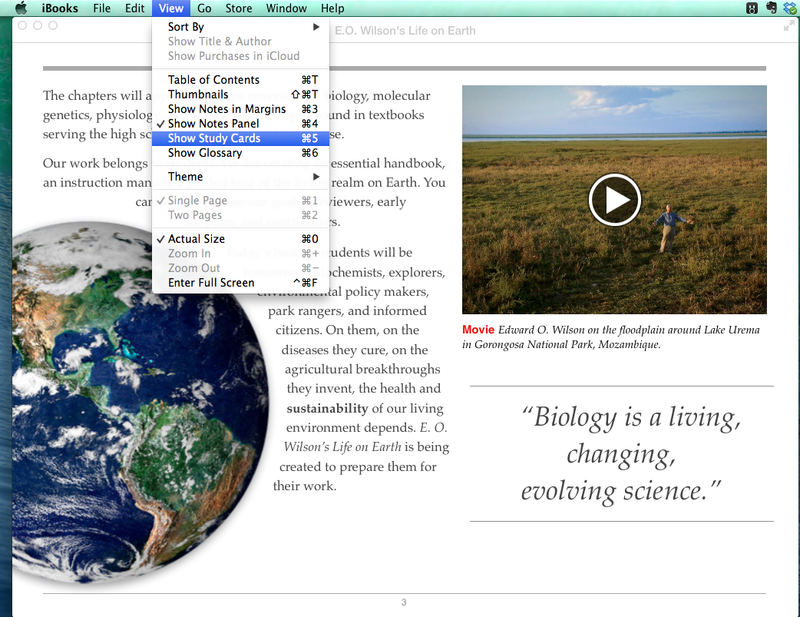 This is a nice feature, especially if you are reading a book for school or are writing a paper. To do so, select the section of the book you want to highlight. 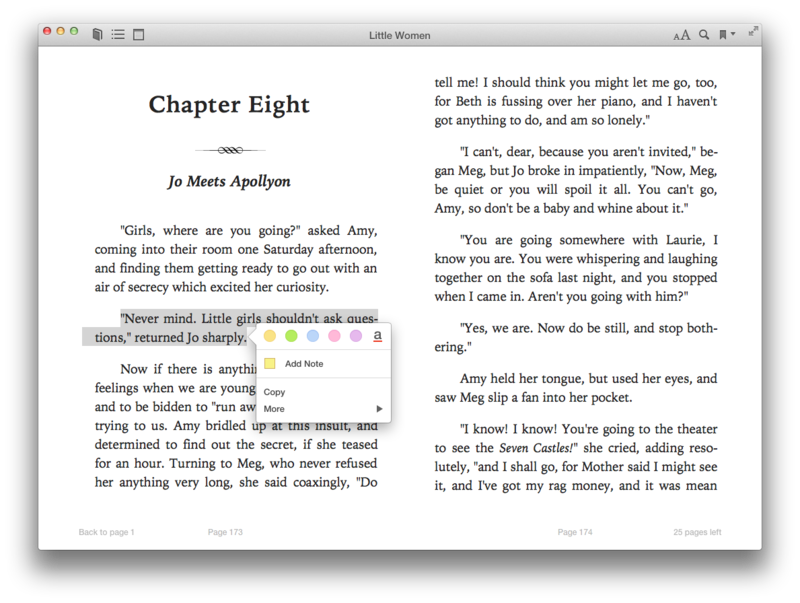 iBooks detects you are highlighting a passage and automatically displays different options for to what to do with the passage. Choosing one of the colors at the top will highlight the passage in that color. “Add Note” will allow you to comment on the passage you have highlighted. “Copy” allows you to copy the text and paste it into a document. 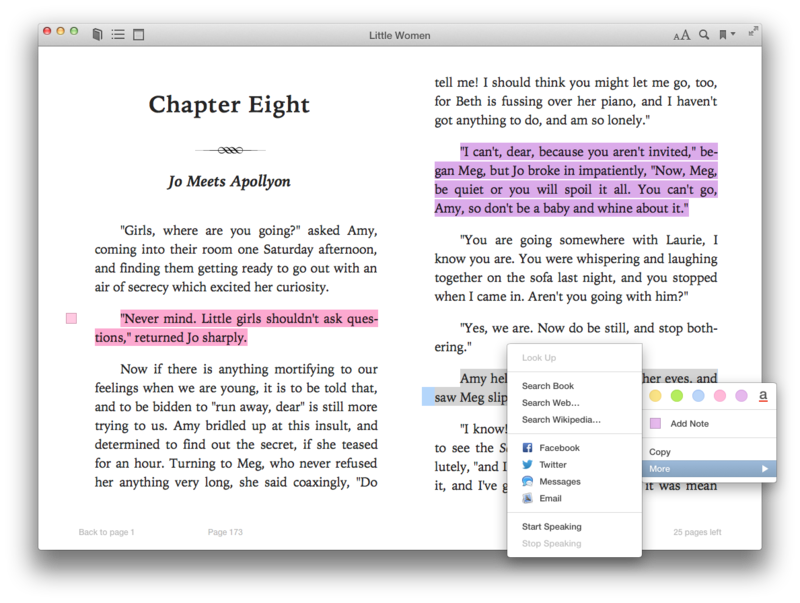 Pasting automatically places the passage in quotes, and includes the title of the original work and a link to the book on the iBooks Store. “More” gives you options to look up information on the passage, search the book, web, or Wikipedia for that phrase, share the passage via Facebook, Twitter, Messages or email, or have the computer read it aloud. To view all of your notes and highlights, click the post-it note icon on the toolbar or press command-4. This opens all of your notes and highlights in a left-hand panel, showing the time and date they were created. Clicking on the page number jumps to the page with the highlight or note on it. When you are done reading a book it is a good idea to place a bookmark, so iBooks will save your place and sync the spot that you finished reading to all of your devices. To make a bookmark, click the ribbon in the upper-right-hand corner, which will then turn red. The triangle right next to it shows you all of the bookmarks you have created in the book. iBooks gives you access to the iBooks Store, which allows you to download new books right onto the computer. To get out of your Library and into the iBooks Store, click “iBooks Store” in the upper-left-hand corner. 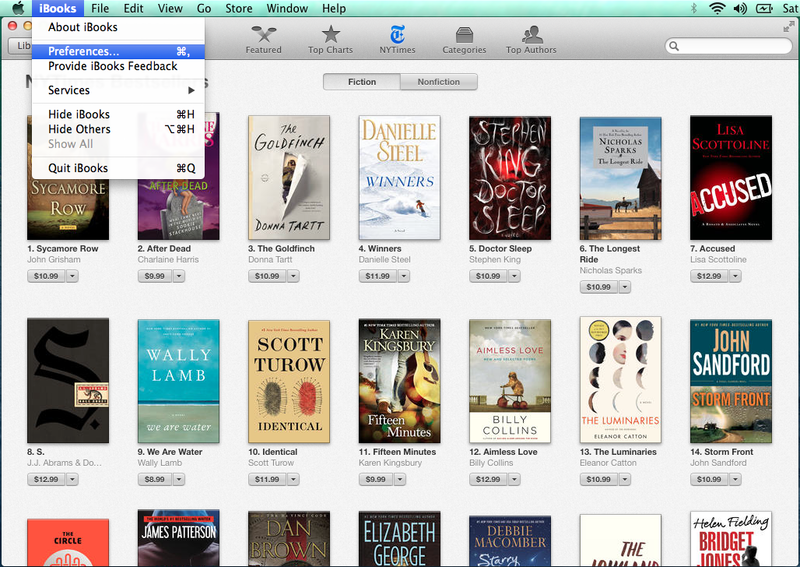 The iBooks Store is laid out just like the iBooks Store in iOS. On the top you are able to switch between different views and categories. 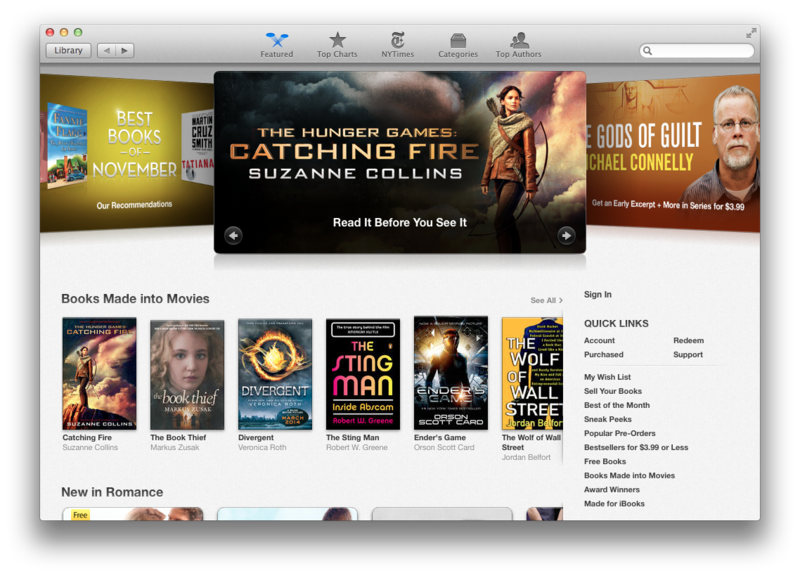 “Featured” is the main page in the iBooks Store and shows you the newest books that are available. “Top Charts” shows you the top 200 most popular books. The “NY Times” button will show you the New York Times Fiction and Nonfiction Bestsellers. 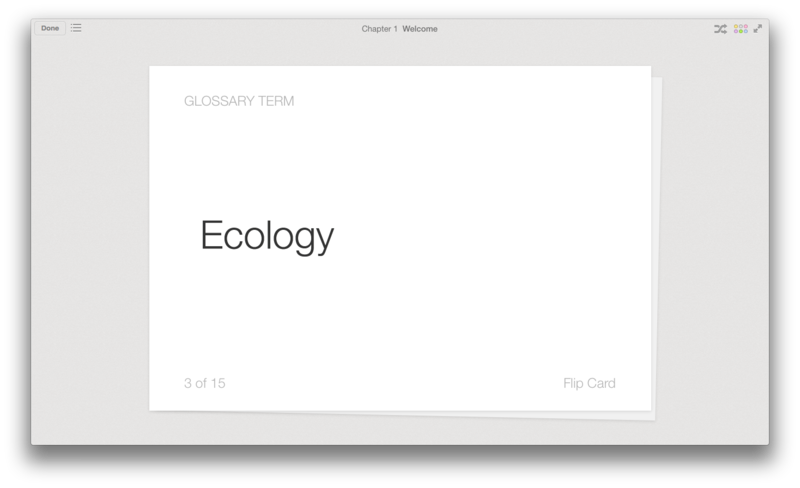 “Categories” will organize the books based on their genres. “Top Authors” will show you the most popular authors in the iBooks Store. There is a search field in the upper-right-hand corner, so if you know what you are looking for, you can type it in and find it immediately without having to browse through the entire store. Clicking on a book will show you a description of the book, screenshots from the book, and reviews by readers. Next, click on the “Parental” tab. From here, you are able to either disable the iBooks store in its entirety, or simply restrict access to books with explicit content. After awaiting 3.5 years for iBooks to come onto the Mac, I am enjoying reading on my computer immensely. 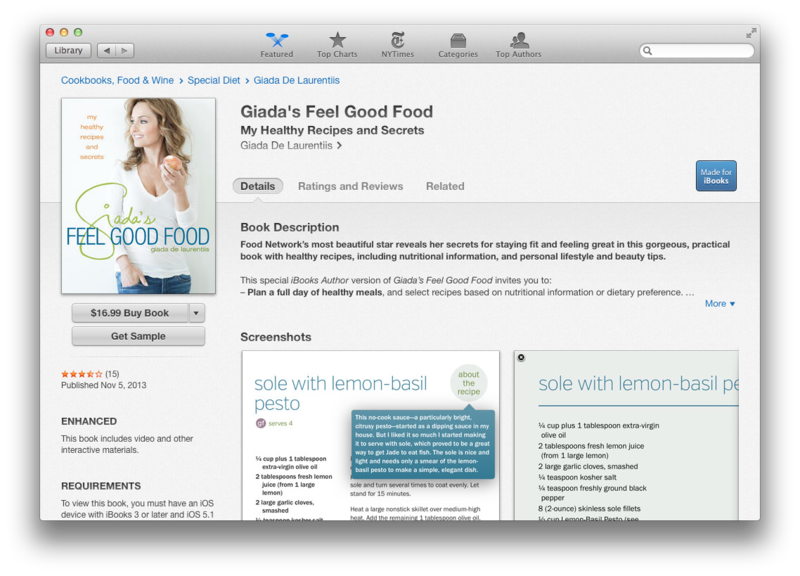 I hope this article has helped you enjoy reading your iBooks on your Mac, too.